Kahlani Pyrah says she was sacked from her job at a Grill'd burger franchise after raising issues about wages. A FORMER Tannum Sands girl is at the centre of a workplace row in Victoria involving the Grill'd burger chain. Kahlani Pyrah, 20, says she was sacked from her job after complaining about pay rates and conditions at the Camberwell Grill'd restaurant. Writing on a United Voice Victoria website, Ms Pyrah said Grill'd had been paying staff below the minimum wage, with no overtime or penalty rates. She said she told managers that staff were sick of being underpaid, and 11 days later she was sacked. Ms Pyrah is in court today as part of an unlawful dismissal case against Grill'd. "I was sacked for standing up for my rights. That's not right," she said. "What really gets me is that now my co-workers will feel like if they speak out, they'll lose their job too. Everyone's scared. 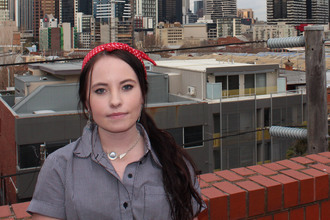 "I moved to Melbourne to go to uni, and I depend on my job so I can live and study. "I want my job back. And I want my workmates to get paid the award minimum and for Grill'd to respect our right to join a union and be treated fairly." A Grill'd spokeswoman said in a statement that Ms Pyrah's claims were "vigorously denied by management and would be strongly defended". She said the workplace agreements in place at Grill'd restaurants were legally valid and ensured lawful rates of pay for all employees. "Grill'd Camberwell is a small family-owned franchise business," the spokeswoman said. "The franchise partners at this restaurant work very hard to make staff and community responsibilities their highest priority."